Senior Kamryn Torr has been a part of the Trail staff for 4 years. 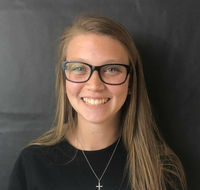 After being a staff writer her freshman year and sports editor her sophomore year, this will be Kamryn’s second year as Editor in Chief for the Trail. Aside from her interest in journalism, Kamryn loves sports. Her passion for sports includes soccer and football. She began playing soccer when she was three years old, but the week before her junior year started, she suffered her third concussion in less than two years and will no longer be playing soccer. Kamryn loves college football, especially Penn State. She is a diehard Penn State fan because both of her parents attended college there. She combines her journalism capabilities and her love for sports into sports writing; Kamryn is often live Tweeting MHS sporting events.